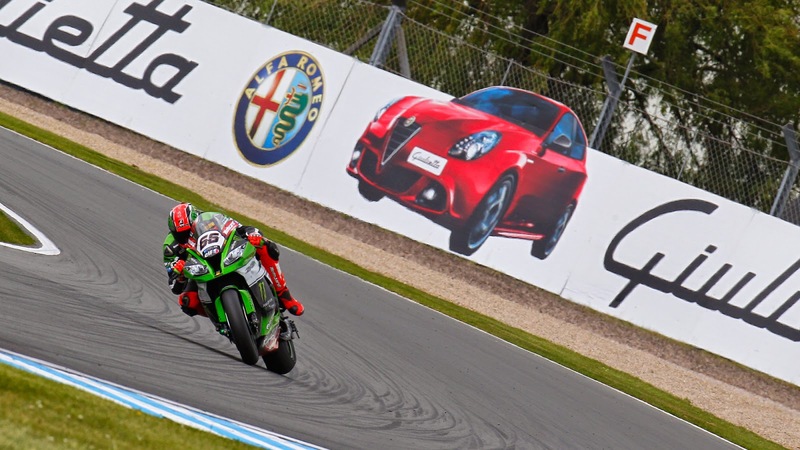 Kawasaki Racing Team’s Tom Sykes smashed his own lap record in qualifying at Donington Park today, as the former world champion took pole position in stunning form in front of his home crowd. Sykes topped combined free practise at the Derbyshire circuit, 0.111 ahead of his competitors as just one second covered the top 13 riders at the lone UK SBK round. Home hero Leon Haslam was fastest in the fourth free practise of the weekend by only 0.087s ahead of Sykes as lap times continued to tumble. Failing to sit at the top of Superpole two throughout the session Sykes came out and put in his record breaking lap with around three minutes left on the clock, shaving 0.3s off his previous record set two years ago. Lining up next to Sykes on the grid is his KRT team-mate Jonathan Rea who was able to break Sykes’ record but unable to find the blistering pace of his fellow ZX-10R rider. Davide Giugliano secured a front row start for his Aruba.it Racing Ducati as local rider Leon Haslam will start from the front of the second row on his Red Devils Roma Aprilia. Alex Lowes secured fifth position on the grid after he sat at the top for the majority of the session ahead of Chaz Davies in seventh.